Today was one of those rare days in which I was able to devote an entire day to aviation. I took a brief break for Breakfast after my morning flight. Then I met John of FlyingChicago.com at the Old T Hangers at Palwaukee where he keeps his 1967 Mooney M20F. We departed Palwaukee and headed east for a flight down the Chicago Lakeshore en-route to Lansing on the South side of Chicago. 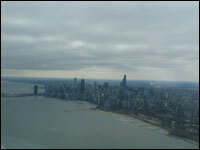 We had a beautiful view of the city of Chicago on our way down and on the way back. We were heading to Lansing for the March meeting of the Chicago Aviation Meetup Group. We had a smooth flight to Lansing that only took about 25 minutes due to a nice tailwind. We met four other aviation enthusiasts at Shannon's Landing, the on airport restaurant where we enjoyed a bite to eat and sharing some aviation stories. After lunch we met Luke from Sun Aero who talked to the group about the helicopter operations and training they offer at Lansing. I learned there are hobbies more expensive then flying, flying helicopters that is. It was cool checking out the inside of some of the smaller helicopters that although small did feel less cramped the then the Cessna 152 I trained in. After an enjoyable time learning about Helicopters we jumped back in the Mooney and flew back up the lakeshore to Palwaukee. The return flight took a little longer as we were flying in the wind but the Mooney still made great time and appears to be a great trip plane. I was turned on to your blog through the AOPA flight training magazine. your pictures are breathtaking....looks like the group fly-in was fun!